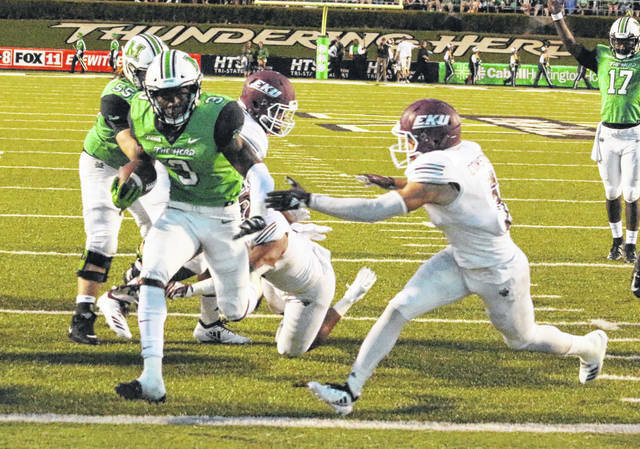 Marshall running back Tyler King scampers into the end zone for a score during a Sept. 8 football contest against Eastern Kentucky at Joan C. Edwards Stadium in Huntington, W.Va.
HUNTINGTON, W.Va. — Far from a fairy tale ending. Visiting Middle Tennessee State overcame a 17-10 halftime deficit with 24 consecutive points, and the Blue Raiders eventually rolled to a 34-24 victory over Marshall on Friday night in a Conference USA contest at Joan C. Edwards Stadium in Cabell County. The Thundering Herd (3-2, 1-1 CUSA East) built a pair of seven-point leads in the first half, but the hosts couldn’t get anything to go their way after the break as the Blue Raiders (3-2, 2-0) produced points on their first four possessions of the second half — giving MTSU a sizable 34-17 cushion midway through the fourth quarter. MU — which had two punts, a fumble and a missed field goal attempt on its first four possessions after halftime — finally broke through on the scoreboard with 2:37 left in regulation as Obi Obialo hauled in a 10-yard pass from Alex Thomson, but the Herd ultimately ran out of time in dropping their second consecutive home decision. Marshall produced a season-high 209 rushing yards and claimed a 28-25 advantage in first downs, but MTSU finished plus-2 in turnover differential and outgained the hosts by a 420-382 margin in total yards of offense. The Blue Raiders opened up a 3-0 advantage with 9:42 showing in the opening frame as Crews Holt successfully converted a 34-yard field goal, but the Herd answered with a 33-yard field goal from Justin Rohrwasser with 2:14 left — tying the game at three through one quarter of play. Anthony Anderson gave the Herd their first lead at the 13:25 mark of the second period after a a 1-yard run capped a 10-play, 87-yard drive that led to a 10-3 advantage. MTSU quarterback Brent Stockstill, however, capped a 5-play, 67-yard drive with a 5-yard run at the 1:09 mark, tying the contest at 10. Marshall quickly responded with a 34-yard kick return from Willie Johnson, then picked up another 42 yards on a pair of Tyler King runs. Six plays later, Thomson found Armani Levias on an 11-yard pass with 17 seconds remaining — giving the Green and White a 17-10 edge headed into the break. The Blue Raiders tied the game at 17 on their opening drive of the second half as Stockstill found Patrick Smith on a 2-yard scoring pass, completing a 12-play, 74-yard drive at the 8:20 mark of the third. After forcing a punt, MTSU took a permanent lead on its ensuing drive as Tavares Thomas capped an 11-play, 80-yard drive with an 8-yard run — making it a 24-17 contest with two minutes left in the third. Thomas extended the lead to 31-17 at the 11:35 mark of the fourth after hauling in an 18-yard pass from Stockstill, then a fumble recovery led to another three points as Holt booted an 18-yard field goal at the 6:23 mark for a 34-17 advantage. King led the Herd ground attack with 165 yards on 27 carries, followed by Anderson with 77 yards on 17 totes. Thomson — making his first MU start in place of injured quarterback Isaiah Green — completed 17-of-34 passes for 173 yards, including two TDs and a pick. Tyre Brady led the wideouts with 58 yards on six catches, with Obialo adding six grabs for 49 yards and a score. Chase Hancock led the Marshall defense with nine tackles. Ty Tyler recorded two of the hosts’ five sacks in the setback. Frankie Hernandez also recovered a fumble. Thomas led the Blue Raiders with 42 rushing yards on 15 carries. Stockstill went 25-of-40 passing for 317 yards and two scores. Gatlin Casey led the MTSU wideouts with six catches for 54 yards. Jovante Moffatt posted a game-high 17 tackles for Middle Tennessee State, which also recorded six sacks in the triumph. The Thundering Herd returns to action Saturday when it travels to Norfolk (VA) for a Conference USA contest against Old Dominion at 3:30 p.m.